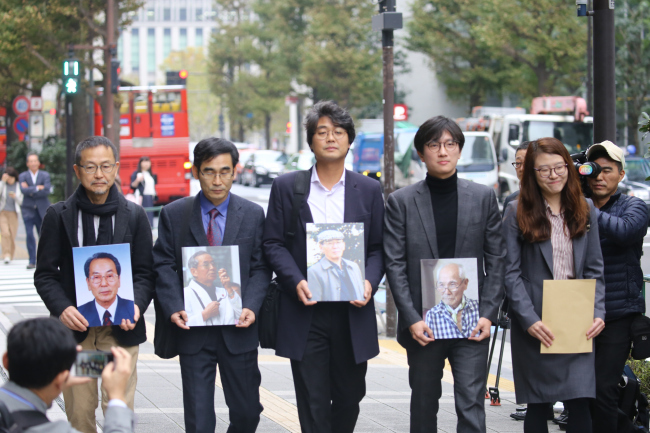 TOKYO -- Supporters of four South Koreans who served as wartime forced labourers for a Japanese firm visited its Tokyo headquarters Monday to demand court-ordered compensation. South Korea's highest court ruled last month that Nippon Steel & Sumitomo Metal pay the men 100 million won ($88,000) each for being forced to work at its steel mills between 1941 and 1943. Only one of the victims is still alive. Lawyers for the men -- accompanied by supporters -- went to the company's Tokyo headquarters to demand the money, but its representatives refused to meet them. Kim Se Un, one of the lawyers, said they will now "start procedures to seize" the assets of the firm's South Korean affiliates, local media reported. The court ruling has triggered a new row between Japan and South Korea -- two US allies faced with an increasingly assertive neighbour in China and the long-running threat of nuclear-armed Pyongyang. Japan's Prime Minister Shinzo Abe has severely criticised the ruling, saying it was "impossible" under international law and that the issue had been "completely and finally settled" by a 1965 treaty that restored diplomatic relations between the two countries. On Monday, cabinet secretary Yoshihide Suga urged Seoul to take steps to calm the situation. "We are asking the South Korean government to take appropriate measures including redressing the current situation that violates the international law due to the ruling by the Supreme Court," Suga said. "We are in close contact with Japanese firms that are subjects of similar lawsuits."